Altera - makes the two 7000S PLD used by the Kodak Eval board -EEPROMs that can be programmed on the eval board by means of a 10 pin JTAG connector. Mitsubishi - artificial retina - CCD array & image processing in one package 32x32 or 128x128 pixels not intended for astronomy, but who knows? An astronomical camera needs to have provision to cool the CCD chip otherwise the noise for exposure times over a few seconds will degrade the image. This is the main separator between conventional CCD cameras and astronomical cameras. For very rough cooled Astronomical CCD camera pricing try 1 cent per pixel or $80 per square mm of active area. Black Cat Technology - uses an uncooled chip with special construction giving 0.00009 Lux sensitivety. 1/60 sec per frame 1/5 sec between frames. A near IR version is in the works. 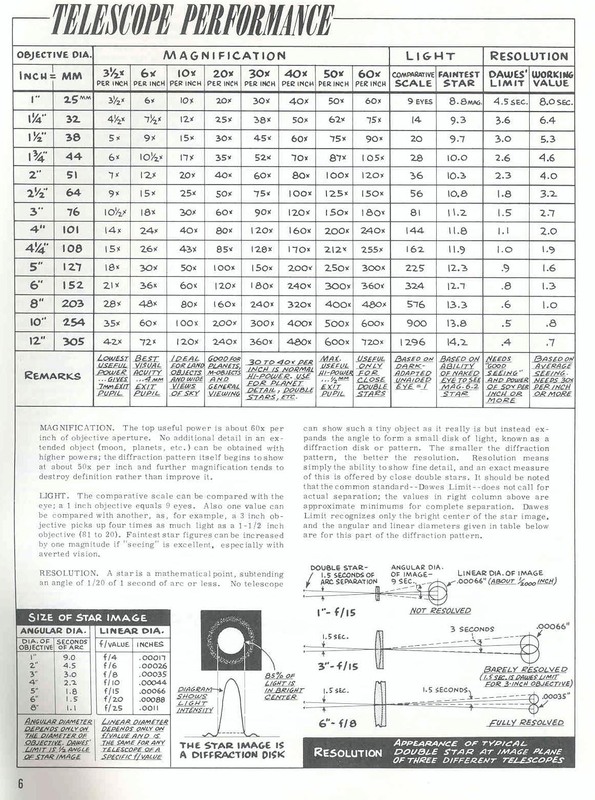 Only 1 1/4" or "T" mount. 512 to 4000 X 4000. How would the BRC-250 work with a KAF-1001E CCD? Could 4 each KAF-1001E CCDs by used with the space < the CCD size (about 1" square)? COMSOFT - software products, a control system called PC-TCS™ for equatorial mounted telescopes and SATPRO™ - an earth orbiting satellite tracking program which can be used in conjunction with PC-TCS™ to accurately track earth orbiting targets. Tpoint Software - TPOINT analyses pointing observations to discover and measure misalignments and flexures, which the telescope's control system can then allow for. I am interested in satellite Orbit Determination (Search) which is different from satellite prediction or tracking where the orbital elements are already known. I have found these different ways of searching the sky. There may be more. Equatorial mount and time exposure. Any streak is not a star and is moving fairly quickly. Equatorial mount and multiple exposures separated in time. Any "blinking" points are not stars and are moving slowly. Any mount stopped with the CCD scanned at the star drift rate. Requires drift track 90 deg to columns in CCD. Any streaks are not stars. Equatorial mount moving at star rate in RA but scanned in DEC & CCD scanned to match DEC rate. Similar to the above. Different scanning methods would be used depending on the speed of satellite being looked for. The first method above would use very short exposure times for low orbiting satellites and longer exposure times for higher orbits. Orbit determination from observations - compute orbit parameters from observations, aimed at NEOs. There are tradeoffs in choosing the parts of a system to do this. 24 April 2005 - The KStar Telescope seems ideal for this application and probably was designed for the Air Force to do just this. It has a 5 degree FOV and uses spherical mirrors (much lower in cost than any thing but a flat mirror) and has an adjustable f number (just the thing to match the CCD array to the seeing conditins. It's either Pat. Pend. or I can't find the patent. One of the RAVEN A.F. Projects uses the KStar scope and the Paramount Mount and software. "Raven is not an acronym; the name refers to Odin’s ravens from Norse mythology. A Raven telescope is not a specific configuration of telescope, mount, camera, and computer hardware and software. Raven is the concept of combining commercially available components and integrating them into a system supporting a specific requirement. Just as you can go into a camera store and purchase a system optimized for a specific need, such as telephoto coverage of sporting events, you can configure a Raven telescope system to support a specific mission, such as follow up observations of near-Earth objects." The Richey-Chretien telescope uses two hyperbolic mirrors and makes a great scope for silicon based imaging, but it's an expensive design and so far I haven't seen them offered with fast f numbers, most are around f/ 10. The military systems typically use 1 meter scopes with low f ratios and very large CCD arrays. They are looking for very small objects meaning star MAG numbers that are quite large (maybe MAG 20+). A system that would do the same job but with a much more conservative visual MAG limit (like MAG 12) should be possible with a much smaller diameter scope. This implies a refractor so that there is no blocking of the light by objects in the scope. It also points to using a high quantum efficiency CCD like the SITe series. The widest possible Field of View (FOV) is very desirable because the time required to search the sky will be reduced. My interpretation of "all about Telescopes" is that the linear image size of a star in microns (um) is approximately the same as the f ratio. That is to say that an f 4 OTA will have an image size of 4 um, f8 will be 8 um etc. The image size is independent of FL if the seeing is perfect. If a video camera is used with an optical system whose objective diameter <=12" then some frames will have perfect seeing. To image also requires a mount that can point extremely accurately, the LX-200 can track a satellite as a point of light, and as a fuzzy image (see the Sat Track software). The Merlin mount or equivalent pointing accuracy type of mount is needed. For larger diameter objectives or exposure times > 1/100 second the seeing will enlarge the star image to about a few arc seconds to a dozen arc seconds. In that case the focal length will be the lever that converts the angle into distance. This is the basis for the recommendations about astronomical CCD camera OTA focal length. In the GEODSS system at Peterson AFB and other locations: " The main telescopes have a 40-inch aperture and a two-degree field of view. The auxiliary telescopes have a 15" aperture and six-degree field of view." CELESTRON FASTAR 8 - aproximatley an f 1.95 Schmidt camera with the camera mounted n front of the scope, but only 30 by 40 minutes of arc field of view. There is a question in my mind about matching the CCD pixel size to the scope FL (popular for star imaging) or to the f ratio which determines the image size or some other criteria. The classical 2 pixels per star is based on the appearance of star images. For this purpose I don't think that is important. For example for widest FOV there would be many stars per pixel. If the satellite moved across many pixels during an exposure it would show up as a streak. If a wide angle lens was used the satellite would be exposing the pixel all the time that it was on that pixel. If multiple stars were on a single pixel it would just add them up. I think you would still see the streak because most of the sky is black. A low orbiting satellite will cross the 5 degree FOV of my binoculars in a few seconds. For high orbits where satellite movement is slow the time between two or more exposures needs to be long so that blinking will find the satellite. There is a tradeoff here between FOV and limiting MAG. More investigation is needed. - My current thinking is to use a night vision device and conventional TV camera. If a streak appears that starts or ends at the edge of the frame then you do not know when the satellite started or ended. If the exact time the exposure was started and stopped is recorded then you will know that the satellite was in the FOV of the frame sometime during the exposure. If a mechanical shutter is used to block the exposure for a short time every so often then the exact position of the satellite could be determined. These are based on CMOS memory chips which are much lower in cost than CCD chips. Quote about a GEN 3 device "One thing I remember about the instrument is how many moving satellites and aircraft were visible in the night sky. With the naked eye, you don't see these dim moving objects readily, but through the night vision scope, they stand out. The sky was being criss-crossed with them!" Night Vision Devices have a phosphor very much like early cathode ray tubes (CRT). And like a CRT they will burn if a bright image is left on the screen for a length of time. If a NVD is left running in daylight the tube will be permanently damaged. To fix this just remove the DC power during the daytime. The NVD has sparkles. The I3Piece has an optional averager that reduces these. A better approach would be to have the computer remove them by comparing the prior and following frame to the current frame. If there is a pixel that is bright but the prior and following pixels are black, then set that pixel to black. These are the kind of image processing steps that the IMAQ image processing package from LabVIEW is designed to do. This looks to be a more cost effective way to see dim satellites and also have a wide field of view. This is an interesting way to see sats. You do not need night adapted eyes to use the NVD since it has a bright output. I use my strong (left) eye in the NVD and keep my other (right) eye open and the right eye does got night adapted. Last night (11/2/99) I saw a sat to the East about 10 deg above the horizon going to the North, later I saw a formation of 2 sats (should have 3 or 4) going overhead to the South. Objective is a lens with a FL in the 30 to 40 mm range and is corrected to focus 400 to 1000 nm light (i.e. short IR and visible are ALL in focus) the area of good focus would be a circle 25 mm (1") in diameter - it is desirable to have no barrel or pin cushion distortion, that is to say the image of a checker board would have straight lines, this may be a 35 mm camera lens or something else? use a relay lens that is designed to work at the wavelength of the output phosphor of the image intensifier tube - it needs to cover the 1" tube output and put all the light on the TV camera chip (1/2" CCD might be a good choice). Software to threshold each frame and look at frame to frame "on" pixels. If a pixel (or one of it's 8 adjacent pixels) is not on in the prior or following frame then turn it off. This should eliminate sparkle noise from the image intensifier tube and not increase the background brightness the way simple averaging would. This can not be done in real time, but as a post processing step. Better would be to de-sparkle real time in hardware. 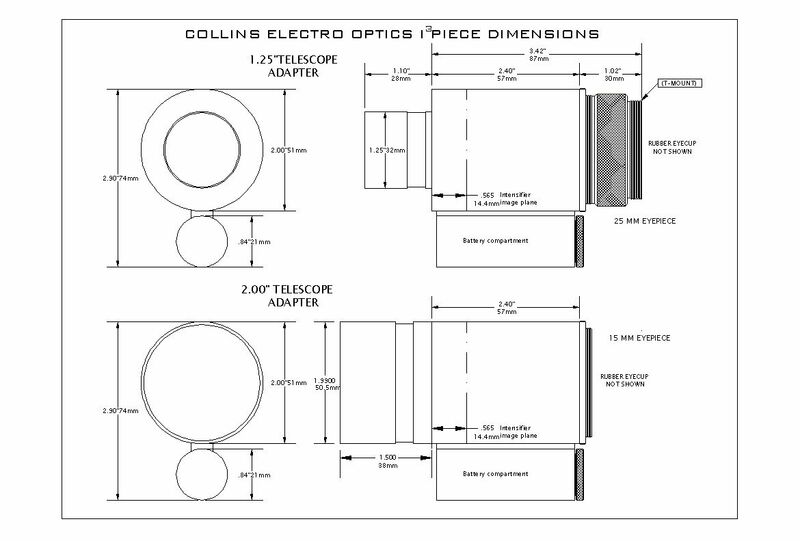 The Collins Electro Optics I3 system is close to this but uses an 18mm (about 3/4") Gen 3 image intensifier tube. The New Adriondack StellaCam EX TV camera may work well without using a NVD. Edmond Scientific - has a C-mount & T-mount modular system of lens holders and relay lens that may make the basis for a system similar to the I3. Sovietski Collection http://www.sovietski.com/ - I got the T3C-3 device ($143+). Although it is claimed to have a 13.7 deg. field of view, outside the center 5 deg it is very fuzzy on stars. The relative brightness of the stars is maintained so star hopping is easy. Since the tube looks like a capacitor, just a press of the trigger keeps the tube going for minutes. You do not need to hold it all the time. I have asked about the out of focus condition and the preliminary response is that this is normal. At the very center of the FOV there are sparkles but they are not objectionable. The number of stars that can be seen is greater in the center 5 deg. than what you would see in the Orion 9x63 binoculars. I think that the objective optics are not focusing on the tube causing the fuzziness. A good system would use an objective that was a 35 mm camera lens (i.e. it is designed for good focus over a diameter of about an inch.). This appears to have a tube with 1" input and 1/2" output. Since it is Russian it must be GEN2 or below. These cameras typically have square pixels and higher resolution that a TV format video camera. They typically use RS-170 Video format. Graftek - software company thathandles cameras, frame grabbers, optics, etc. If only the RS-170 (or CCIR) analog camera output is fed to the frame grabber then there can be a pixel of jitter due to timing variations. If a digital output camera is used the correspondence between each pixel and the data will always be the same, but for more money. I much lower cost way to lock the data to the pixel is to get an optional pixel clock output from the camera to sync the frame grabber. If RS-170 format is used a S-VHS VCR will record hours of images with very high quality and allow freeze frame playback into the frame grabber, but without the pixel clock. Direct recording of the frame grabber to the hard drive is possible using specialized video workstation computers. Optionally direct recording to computer RAM from the frame grabber is also possible, but with limited time capability. If the computer is fast enough it might be albe to extract the moving objects. In order to analyze the data from a staring video camera you need to be able to stream the video onto hard disk. The low resolution B&W images involved here should not tax the hard drive. For full color streaming video Ultra Wide SCSI drives are recommended. To get the required camera to RAM or Disk transfer speed most frame grabbers use the PCI buss with "bus mastering". The PC104 camera runs a normal frame rates with good low light sensivity. Satellite appears as a point of light which is the easiest and can be done using video or 35 mm camera lens on TV camera. Imaging the shape of a satellite which requires an astronomical scope and tracking mount, although some have been able to use non motorized mounts. After the observation each video frame is examined to find the ones where the seeing was good. The relative accuracy of the mount needs to be matched to the FOV of a single pixel. For declination scanning the mount needs to support multiple scan rates in declination. The mount must be able to easily carry the OTA and camera while still providing very good tracking. Some people feel that the mount is THE most important part of a CCD imaging system. While compiling the spreadsheet below I found that the pointing accuracy, or whatever it's called, specification on mounts is not at all standardized and in many cases is not specified. That makes it difficult to tell which mount is giving the best performance for the money. There are some web pages where an image of some satellites can be seen. In all of the other satellite viewing cases the satellite shows up as a point source of light with some brightness variation. The Mead hand controllers can only be used for leap frog tracking, but the LX-200 (and a couple of mounts that have full LX-200 emulation) will also allow continuos tracking so that video imaging can be done usingSatTrack software. Because of atmospheric "seeing" effects 99 out of 100 frames will be blurred. By searching the video tape frame by frame a good image may be found. Note that because of "seeing" you can NOT use a scope larger than 12" and that's the size used for the web imaged photos. The newer Mead LX-200GPS scopes hae not yet been qualified with SatTrack (19 Aug 2002) but the older LX200 scopes will do continous tracking. Most all other socpes can only do leap frog tracking. May 30, 2003 - the LX-200GPS still is not where it need to be in terms of firmware. Also the GPS can not update the computer clock with enough precision. Note that a satellite will pass through the FOV of an astronomical scope that has enough magnification to image the sat in a fraction of a second. If the computer clock is off by that fraction of a second then you will not see the sat. As far as I know there is not any amateur software available for Satellite Orbit Determination (Search). When a satellite is "tracked" using a telescope you see just a dot of light, like a fast moving star. Imaging takes much more magnification and a very smooth mount. The ideal case is a professional mount on a good pier. Some of the best images from Ron Dantowitz were taken in the daytime. Astro Spider - hobby grage equipment and very good results. RC Optical Systems - High Speed Cinematography... - truly amazing video of 747-200 at 36,000 feet at 1,000 frames/second! John Locker - Satcom images & video SIGINT. NASA Near Earth Objects - comets, asteroids, etc. Full-sky Astrometric Mapping Explorer (FAME) - The CCDs will be used in a time-delayed integration (TDI) mode to synchronize the charge transfer with the rotation of the spacecraft. AAVSO Network to Search for Optical Counterparts of Gamma-Ray Bursts - which are found with the BATSE (Burst and Transient Source experiment) instrument aboard the Compton Gamma Ray Observatory satellite - but they need CCD equipped telescopes to look for the after glow. 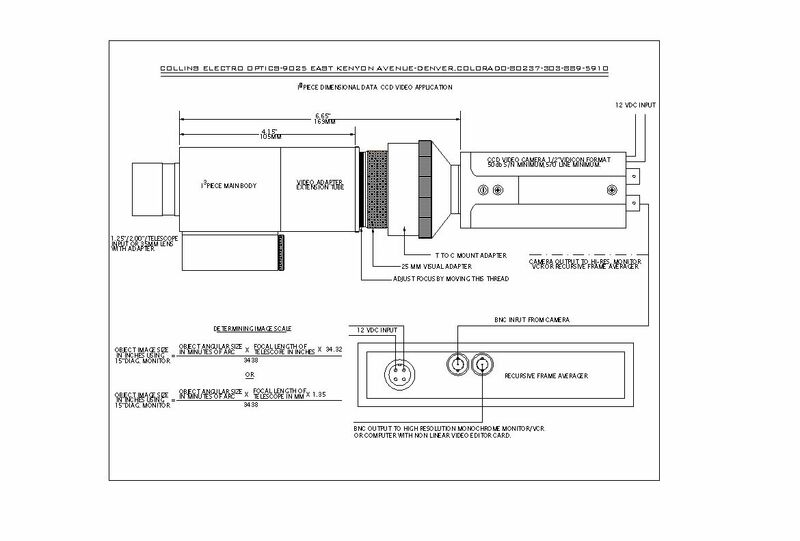 BlackBoxCameraTM Company Limited - uses the STV5730A and a PIC16F84 to add text to video. CCD Astronomy and few other things - Eddie T.
Wil Milan's Astrophoto Equipment - he says "Takahashi Epsilon 130 is an extremely fast (f/3.3) Newtonian-focus astrograph capable of extremely high resolution" this is consistant with my idea about the f number being equal to the image size in microns. This is the [an error occurred while processing this directive] page created 19 Jan. 2000.